Beautiful ice sculptures, made by Mark Szulgit and Brooke Erdman, representing the famous painting of the Norwegian painter Edvard Munch, "The Girls on the Jetty". The American architect and artist Mark Szulgit (43), who was one of the designers of the world-famous Swedish Icehotel in the village of Jukkasjärvi, is an ice expert, ice sculptor and steel designer, who has been working for a long time in Swedish Lapland, Norway and Colorado (USA), on several prestigious ice art projects, often accompanied by his partner, the American artist Brooke Erdman. Mark is a designer specialising in large scuptures in a variety of media. In America, he created an impressive artwork of steel, in the shape of desert thistle, called Reno Star (see below). However, his favourite building materials are frozen water and snow. Mark started applying his architectural skills, experience and vision to ice-based structures in 1998. He has been working on the unique Swedish Icehotel, about 17 kilometres from Kiruna in Swedish Lapland, for 10 years. The world's first hotel entirely made out of ice was created for the first time in 1990. It is always a temporary structure, built in November each year, melting away in April. The world renowned Icehotel has been built for 24 consecutive years now and will celebrate its 25th anniversary in December this year. The hotel has always been built by a team of architects and artists on the northern outskirts of Swedish Lapland in Jukkasjärvi. Mark Szulgit: "I love working with ice, one of the purest building materials in the world." 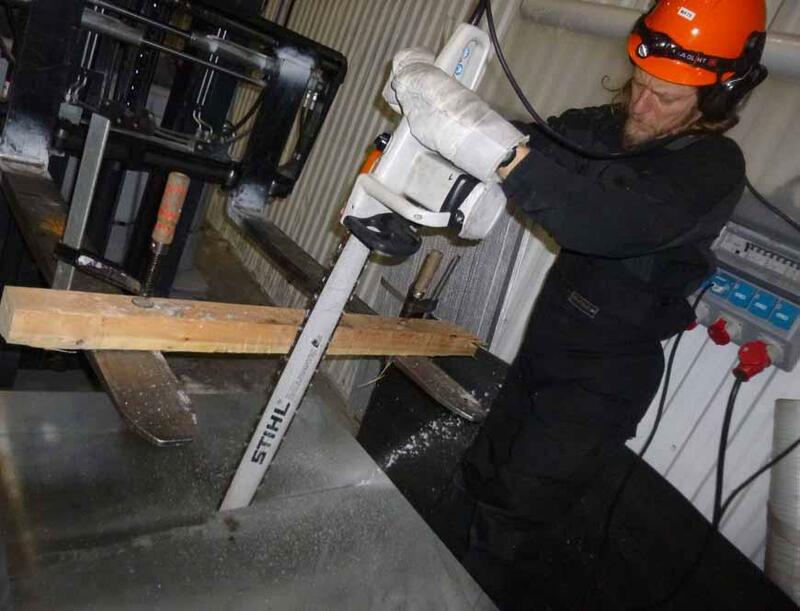 Mark Szulgit is carving out a parabolic sound lens for the 'Future Ancestors' suite at the Icehotel Jukkasjärvi in January 2014. By sawing up an ice block into two pieces he creates two sound lenses of a perfect diameter. The lenses are placed opposite each other in the hotel room, 7 metres apart. A person can whisper into one lens and another hear the whisper from the other lens on the other side of the room. Mark Szulgit has been a snow and ice fanatic all his life. The only thing that is missing is an igloo. Mark lives in California, although not in an igloo. He can best be described as a warm personality working with cold material. His partner in love and art, Brooke Erdman, jokingly calls him: 'The Iceman'. Mark Szulgit feels he is an architect and an artist. He studied architecture at the University of Arizona in Tucson (USA) in the middle of the desert where he graduated in desert architecture, designed for arid climates. While working in Stockholm as an architect he decided in 1997 to leave the architectural company he was working for after reading a newspaper article about the Icehotel in Swedish Lapland. He wanted to create ice architecture and started working for the Icehotel. Mark has worked intimately with ice and snow for about 15 years, both in design and production. 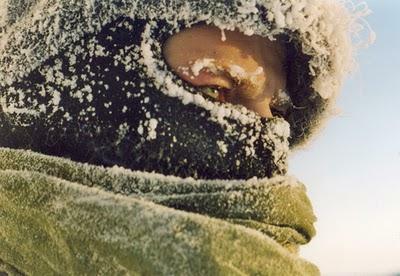 He loves challenges and working in an environment in northern Sweden where temperatures fall to 30 degrees below zero. That doesn't stop the ambitious ice expert from working with ice, "one of the purest building materials in the world". Even as a boy living in Rochester (New York) he was fascinated by ice and snow. Mark says: "As a child I would build igloos and snowmen. In New York there was a lot of snow. Now, working with snow is also an extension of my skills in desert-building. When you build in the desert, you build with mud. There is a large similarity between working with mud and snow and ice. In the desert you gather earth, pack it together and stack it. It is done all over the world for making mud bricks, earthern walls, domes and vaults. When you work with snow and ice you actually do the same. You gather natural materials such as snow and then, like with mud, you pack and stack it. The two materials behave structurally and thermally in the same way. In Lapland, when you make sculptures or buildings, for example a hotel or an igloo that functions like a music hall, you work with snow and ice." 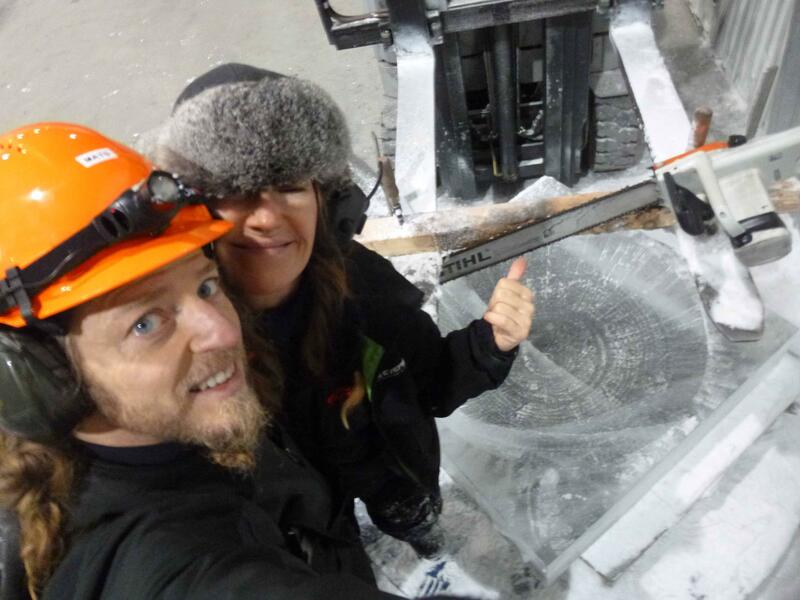 This last month, in Swedish Lapland, Mark and Brooke have assisted Tim Linhart who has designed musical instruments made of ice and a music hall in the form of an igloo in Lulea. Mark helped Tim building the music hall. He was leading the construction and also designed the lighting. Mark Szulgit: "You have to make the ice look like ice. It is as beautiful as a piece of marble." Mark fell in love with Sweden and speaks Swedish fluently. 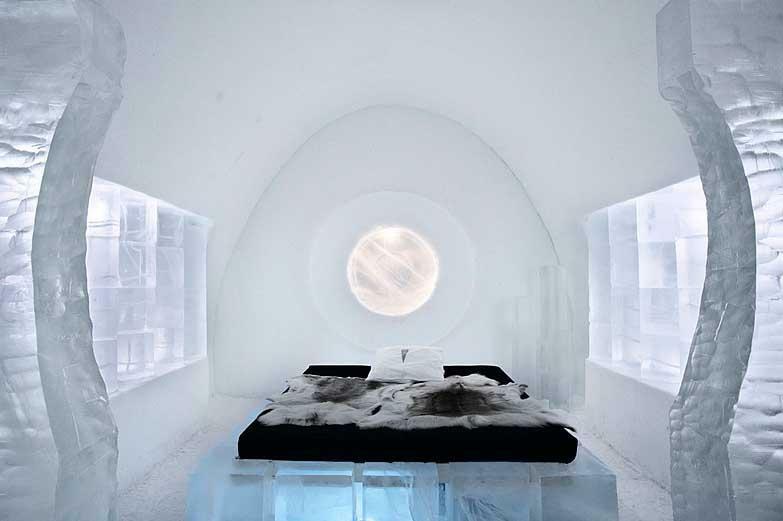 He designs ice art, builds ice hotels, ice sculpture and even ice music halls in the form of igloos. After about 4 months all his snow and ice artwork melt away. This does not stop him from building in ice. For Mark time is not a predominant factor. He works for beauty, the art of ice sculpting and he loves the challenges of working with temporary art. Mark adds: "I love working with ice and snow. You have to make ice look like ice. Ice is very heavy and is very beautiful, inside are many cracks and bubbles. It is like a transparent piece of marble." His partner Brooke, an expert on working with fabrics, is full of praise for Mark's talent with ice and says: "Mark knows a lot about ice, after having worked with it for so many years. He knows how to harvest, construct, light and photograph ice and also how it behaves over time. He knows how much energy it takes to melt ice and how much energy it takes for nature to make ice." The ephemeral character of building in ice is no obstacle for Mark. He explains: "Some buildings are built for a 1000 years, some for a 100 years, and some last only a few months. This is inherent to working with ice and snow. It melts every year, and in winter you have to start all over again with a different idea. That is the beauty of this kind of art. My philosophy with sculpture is to always look at the unique properties of a material and then to accent and highlight those properties." Mark has lectured on ice art and architecture at several universities and institutions in different countries, including America, Australia, Austria, Guatemala, Norway, Sweden and Hungary. Mark also consulted and participated in building the world's largest single room igloo (23 m high) in the Italian Alps in 2008, which is still used to date. The Girls on the Bridge, in ice, a sculpture created by Mark Szulgit and Brooke Erdman, inspired by the famous painting by the Norwegian painter Edvard Munch. During the Nordic World Ski Championships in February 2011 in Oslo, the winter capital of the world, the scenery was a spectacular display of ice art. Ice sculptors from all around the world came to Norway to create their own interpretation in ice of several paintings by the famous Norwegian painter Edvard Munch. One could wander around in the world of Munch, where well-known paintings like 'The Girls on the Bridge', 'The Scream', 'Golgotha', 'Kiss', 'The Sick Girl' and others have been recreated in stunning ice sculptures. On Karl Johans gate, the main street in Oslo, beautiful sculptures created by artists such as Mark Szulgit and Brooke Erdman could be seen. They sculpted an interpretation of two famous paintings of Munch, 'The Scream' and 'The Girls on the Bridge' in freezing winter time. 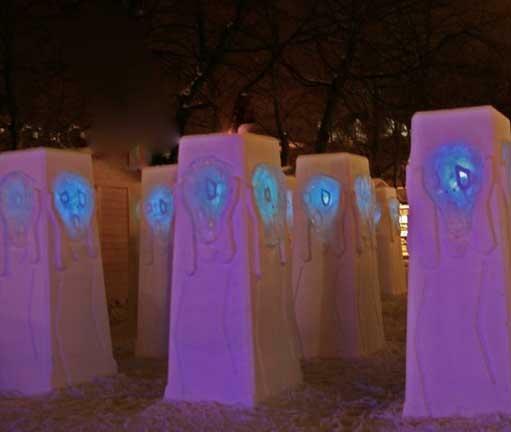 Twelve international artists were selected to create ice sculptures of Munch paintings in the city of Oslo. Mark Szulgit and Brooke Erdman were commissioned to recreate these two much-loved paintings, 'The Scream' and 'The Girls on the Bridge'. The latter was to be installed in front of the Royal Palace in Oslo, at Palace Hill, a task of great honour. The sculptures were located in almost the same spot where Munch painted his original masterpieces in 1892. Mark Szulgit continues: "The 'Edward Munch in Snow and Ice project' consisted of a dozen snow and ice works of art on Karl Johans gate in downtown Oslo and other places, like Palace Hill, where we built 'The Girls on the Bridge'. Each commission was inspired by a painting of Munch. Brooke and I won two of the eight commissions, 'The Girls on the Bridge' and 'The Scream'." ''The Scream'', the world-famous painting by Edvard Munch, sculpted by Mark and Brooke in Ice, in Oslo (2011). "The sculptures had to be completed in a week on site and would remain frozen throughout the festival." Brooke enthuses: "I particularly enjoyed the large-scale possibilities of working with snow and ice, its ethereal beauty, and the fact that it is quite temporary, because it melts away after a while. However, with snow you can work on a large scale relatively quickly. I am fascinated with that. 'The Girls on the Bridge', also called 'The Girls on the Jetty', could be described as a piece of art in perspective. Standing in the right spot in front of the sculpture, you saw what looked like a pier which extended several hundred feet. When walking along that pier, the pieces became smaller. I made various sizes of figures to give the illusion that the pier continued on, so the figures needed to become smaller as they moved up the wedge-shaped pier. I redesigned the Victorian dresses for this artwork, fashioned the basic support forms out of wire and froze the fabric into figures. Then I shaped the figures in similar positions as the girls in Munch's original paintings. Munch actually painted several versions of' 'The Girls on the Bridge' and we wanted to represent a composite of all of them in this one piece." Mark adds: "Our modern interpretation of Munch's classic painting consisted of 12 ice figures ascending a bridge that was nearly 50 foot long and about 15 foot tall. It was prominently placed in front of the Royal Palace." The stunning scene of the female figures represented by frozen linen in front of the Royal Palace was a gratifying experience for Brooke and Mark, who took Munch's two-dimensional painting 'The Girls on the Bridge' and transformed it into a spectacular three-dimensional scene. 'The Scream' was made of 25 snow obelisks in a grid and each obelisk had 4 abstracted 'Scream' faces which lit up in colour changing lights. When entering the centre of the artwork, this Scream icon could be seen in every direction staring back at you. Brooke states: 'We felt that this famous work of Munch has become so iconic that it would be perfectly represented in a pop art fashion. And we also felt that the public nature of the entire 'Munch in snow and ice' project could use a piece that children would thoroughly enjoy. We were correct, that piece was particularly enjoyed by children." Hovden Ice and Snow Sculpture Festival 2011: Brooke Erdman is fully concentrating on creating a finished textured on a sculpture. 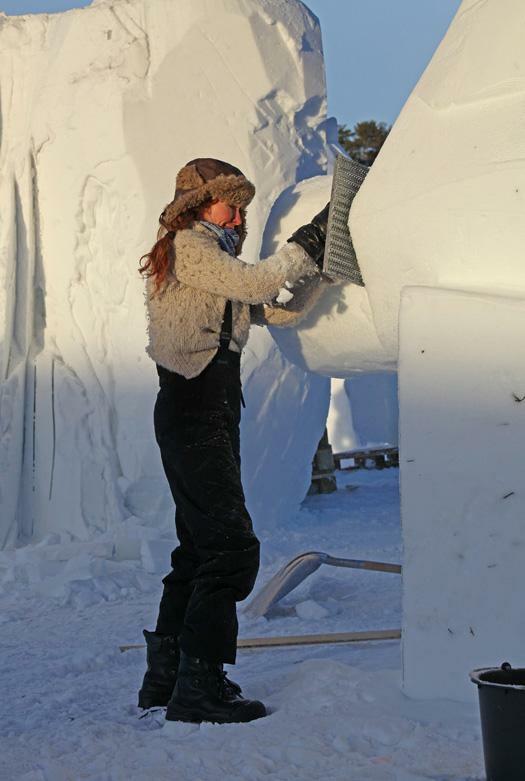 At the Hovden Cultural Festival, Norway, (Snøskulptur Hovden, 2011) professional snow and ice sculptors, assistants and beginners took part in a large sculptural project. The Hovden Festival aims to become the leading resource centre for highly artistic snow and ice sculptures in northern Europe. In 2011 the organisation of the festival gathered about 12 teams, making in total at least 10 sculptures in snow and ice. All the artists worked with prefabricated blocks of packed snow ready to be worked with. Mark Szulgit and Brooke Erdman also participated in this cultural event. Mark comments: "The Hovden project had a very special effect, because it was not financed by tourists or big companies. It was not affected by commercialism or crowd pleasing, like other cultural projects. We have been working for five years in Hovden, a town in Norway. We have been making contemporary art there with snow and ice. 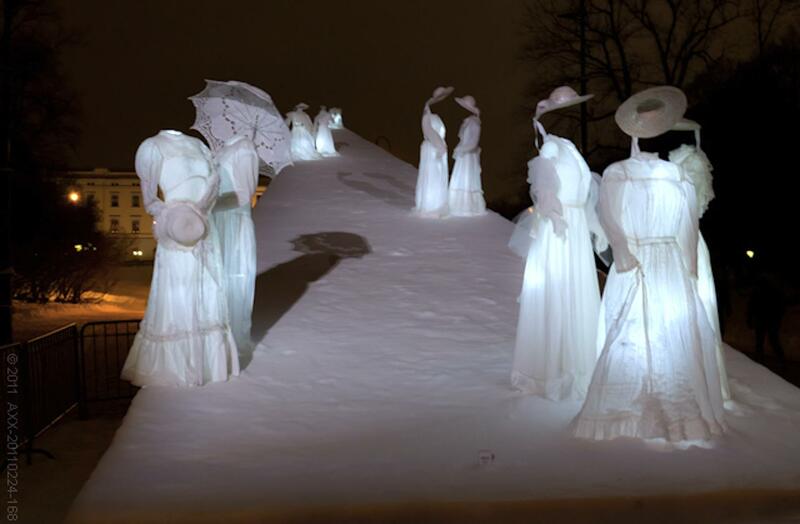 There are many snow festivals in the world, but this one specialises in contemporary art. I worked with Brooke and several other artists. We created large abstract snow and ice sculptures. We worked for one week and then went home. We have taken part every year, so I think it is a success. There were 12 teams of two persons participating. Building in snow means building with different techniques. For the Icehotel we used structures like stainless steel tunnels. In the case of Hovden we used a big box form, filled it with snow, alllowed it to harden, so that we could start with a block of snow which was carved down." The Snøskulptur Hovden' is a project for sculptors in the mountains of Norway. For ten years (1998-2008) Mark Szulgit has been working for the world-famous Icehotel in Swedish Lapland. The Icehotel has been one of his major projects in snow and ice. During that time he lived in Lapland. The Icehotel Jukkasjärvi was the world's first icehotel. The hotel is not a permanent hotel. It opens every year in December, and around April it melts and the next autumn the producers have to start all over again to create this hotel for 4 months, with about 15 bedrooms designed by artists. From October to December, 40 artists, builders and light designers gather in Jukkasjärvi to create a world unique art project made out of ice and snow. Every winter for almost 25 years the Icehotel rises again and every time with brand new art. It is about being inspired by ice as a material – the imagination is constantly challenged and so is the vision of art. Mark Szulgit says: "The Icehotel is a major organisation. The hotel has been designed over the years by dozens of artists and architects. They all construct, build and design together. A Christmas holiday at the Icehotel is an experience unlike any other. One stays in beautiful suites surrounded by artwork made of snow and ice, which allows you to experience winter up close. Different renowned artists have been invited to create special ice art for the hotel and have come back several years to create ice art bedrooms. Thanks to working for 10 years on the Icehotel, Mark Szulgit has gained a lot of experience in the lighting and photographing of ice and also in builing with ice and snow and has acquired enough knowledge of the properties of ice and snow to be called an ice expert. Mark: "I like to use ice and snow as a contemporary, artistic material and even though it is quite an easy material to work with, the professional quality of the work is the most important thing to me. I like to incorporate the aspect of time in the project, recognising how the material will change as it melts. But time is only one variable. I know that my artwork is temporary and very labour-intensive, but that is all part of the work.'' Mark continues: "I worked as a designer for the Icehotel, I was closely involved in the evolution of the Icehotel. Working at the Icehotel is a beautiful experience. Jukkasjärvi ice is a marvel." Mark Szulgit proved to be quite a unique steel designer. The Reno Star ìn Nevada (see photo below) is a 46 foot tall, 8 ton steel sculpture made from repurposed steel beams. Its a public sculpture commissioned for Reno, Nevada Arts & Culture Commission in 2012. Mark declares: "We worked on this project for over a year. This sculpture is a symbol of high desert flora. The Reno Star was first exhibited at the Burning Man Festival in Nevada. Burning Man is a large art festival in Nevada. The sculpture was first painted white and lit up with multi-coloured changing lights for its one week installation at Burning Man. Afterwards it was painted red and installed in its permanent location. It has been designed in our studio in Northern California, where we live." Brooke adds: "The city of Reno had a large collection of used steel and the community wanted someone to do something beautiful with it. So they called upon artists and chose Mark's ingenious design. Mark explains that he wanted to use the steel in an organic way. "I wanted to make a very large, natural, voluminous and elegant sculpture. If you look closely, you wil see that the steel gracefully bends, on the end of each stine, very softly like a blade of grass. 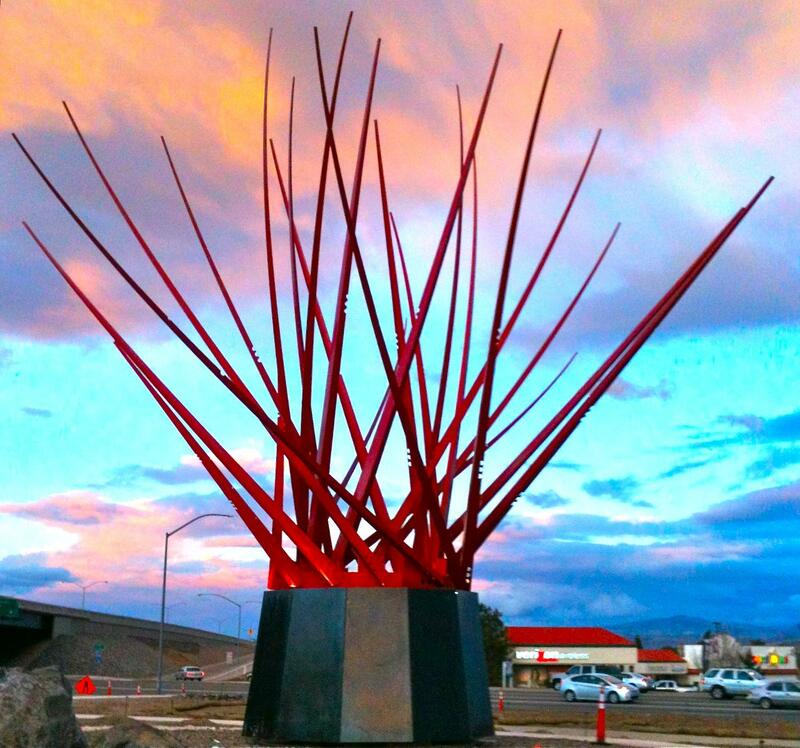 We chose red as the colour for the final sculpture to accent Nevada's big blue sky." The Reno Star has been installed at the busiest intersection in Reno.